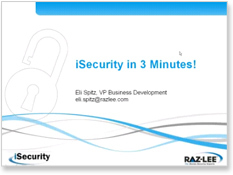 ShmuelZailer, CEO/CTO at Raz-Lee Security, the developer of the iSecurity suite of solutions for IBM i, stated: "While the iSeries / AS400 may be immune to PC viruses, the AS/400 is also commonly used as a file server for PC files. Our iSecurity Antivirus ensures that files stored on the iSeries Integrated File System (IFS) can't infect other computers and files by passing on viruses." Mr Zailer also emphasized the need for companies to install comprehensive safeguards that meet current regulations and compliance requirements, such as PCI, SOX and HIPAA. The latest version of iSecurity Anti-Virus is the quickest and most effective way � and now also the most cost-effective � for companies to maintain an optimal level of vulnerability management. Amir Harel, AH Technology's CEO added, "After a successful year of new product roll-outs, this is our way of giving something of value back to the AS400 community; iSecurity Anti-Virus will help companies reduce their risk of incurring legal penalties and fines." iSecurity Anti-Virus is also available in an Enterprise edition which offers additional real-time protection, SIEM alerts and object integrity checks. Until end of March, companies can upgrade to the Enterprise Edition for a reduced investment. Raz-Lee Security is a leading international provider of security, auditing and compliance (SOX, PCI, HIPAA, etc) solutions for the IBM i. Raz-Lee's customers include companies of all sizes, from SMBs to enterprises with hundreds of systems, in all vertical markets and industries. Financial institutions such as banks and insurance companies are especially well represented. About AH Technology Pty Ltd.
AH Technology is a market leader providing system management, automation and security solutions to its IBM i (AS/400 / iSeries) users in Australia, New Zealand and South East Asia since its inception in 1985. Our technology partners offer world class solutions which significantly improve audit and compliance capabilities and reduce complexity and management costs.